Sony Pictures came back into Hall H with an impressive array of Spider-Man films. Although Spider-Man: Far From Home wasn’t there, Sony brought Spider-Man: Into the Spider-Verse and Venom instead. Needless to say, Spider-Man: Into the Spider-Verse easily impresses with it’s animation and humor. The scene cuts to Miles Morales in a cheap copy of Peter’s Spider-Man suit. He clearly needs support as he’s talking to Peter Parker’s gravestone. A dark silhouette swings in behind Miles. But when he tries to get his attention, Miles electrocutes him and Peter accidentally shoots Miles with his web. Peter is unconscious. As Miles investigates, he realizes that the man is actually the non-dead Peter Parker. With a bit of bad timing, the cops arrive to the graveyard. They believe that Miles is harboring a dead homeless man around. Miles uses Peter’s web shooter to get away from the cops. They start swinging but they crash into the side of a bridge. When Miles promptly shoots web again, it hits a subway train passing by. They get dragged around the city while a poor Peter Parker is still knocked out. The next scene has Miles tying Peter up on a punching bag. Miles doesn’t believe that he’s Spider-Man because, for one thing, Peter Parker isn’t fat. However, both of them know they’re Spider-Man because they both possess spider sense. As Miles is interrogating him, he breaks free and kicks Miles away. Now, we get a montage of scenes including a reveal that Wilson Fisk is the movie. They’re breaking into a Fisk lab and stealing something. The bad news is that all the scientists there are heavily armed. Miles and are escaping from Fisk and learns how to swing the hard way. Fortunately for Miles, Spider-Gwen saves the day. We find out that the girl that Miles met at school is actually Gwen Stacy. She also reveals that she’s from a different dimension. Next, a lady who may be Aunt May gives the spider people Pym tech key cards. It’s here that Spider-Man Noir (Nicolas Cage), Penny Parker and SPDR, and Spider-Ham (John Mulaney) will all be a part of the SpiderVerse. 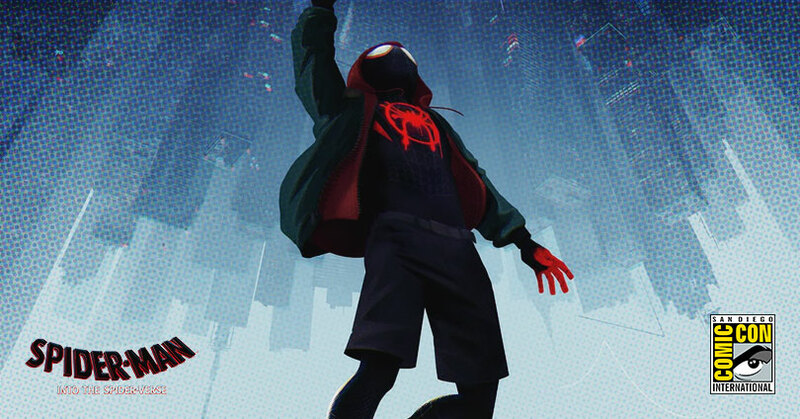 The post SDCC: Spider-Man: Into the Spider-Verse Hall H footage reveals three new characters to the spider gang appeared first on Nerd Reactor.